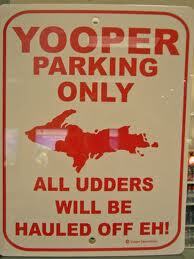 I'm a Yooper and proud of it. It's an exclusive club. You are either born a Yooper, or you get a Yooper green card until you live in the Michigan Upper Peninsula long enough for the locals to forget you aren't native. When I was a kid, we said we were from the U.P. Somehow that morphed into Yooper. As you read this, I'm on a road trip from home (between Milwaukee and Madison) to Rock, MI, where my family still has a 'camp'. Eighty glorious acres - wildflower fields combined with pine ridges. And the dinkiest house you'll ever see. Since the Finns and Swedes settled the area, and saunas are big with them, the camp used to have a sauna. Until my brother accidentally burned it down. On the way to our place, I'll stop in Escanaba for a pasty (pronounced past-ee), not to be confused with those things exotic dancers wear on their..you know. Those are paste-ees. A pasty is like a pot pie, sort of, stuffed with meat, potatoes, onions, rutabagas, and whatever else. We drench them in ketchup and dig in. My very first mystery (Murder Passes the Buck) was set in the U.P., because that's what I know best. 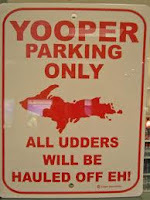 Yes, Yooper's rock! We can do the hokey pokey and the chicken dance. We can tell the difference between a squirrel and a skunk. We think 40 below is a 'might chilly'. And yes, we roll in the snow naked after our saunas, while all God's creatures look on. Have a great time on your trip back home to the camp. It sounds like a wonderful place. Okay. . .you had me until you started rolling in the snow naked after the sauna. Don't mind the deer looking on, don't mind the naked, it's the SNOW on my bare body I'm not crazy about. I DO NOT like the cold. I'm a HOT girl. Colorado winters are cold enough for me. Brrrrrr! Have a good time at camp. Sounds like a great place. Have fun and a safe trip home. Yooper heaven! Enjoy. 80 acres of wildflowers? That would be fab. Enjoy the pasty eatin'. I learned the pronunciation from The Cat Who...series back in the day. sounds like fun! Have a great trip! "Camp" another MI term!!!! Now I want to have pasties for supper :-) I am a born and raised "troll" (those who grew up in the lower peninsula or "under the bridge") and love the UP!! Have a wonderful time and enjoy PURE MI!!! Sounds like it will be great fun. Enjoy the trip & when you come back please show up some pictures. Say yah to da UP, eh! One of my very dear friends is a Yooper, and for a short amount of time I was a troll. I used to know how to say "Merry Christmas and a Happy New Year," in Finnish, thanks to her! And boy does she ever go on about pasties. I love what authors do with that area... Some of my favorite ones use that part of the world for their mysteries. Want it delivered Friday, August 20?